A Chinese woman who investigators suspect was working for Beijing's intelligence services was indicted by a federal grand jury in Florida on Friday and charged with two federal crimes. Zhang Yujing, 33, was indicted for unlawful entry of restricted grounds and lying to investigators after she managed to gain access to the presidential retreat. 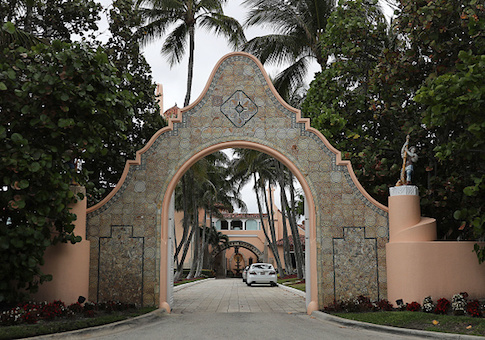 Zhang was arrested at President Trump's Mar-a-Lago Club in Palm Beach on March 30 carrying two passports and several types of electronic devices. A search by investigators of her hotel room revealed she was in possession of a video detection device and nearly $8,000 in cash, credit cards, and computer gear. If convicted of the charges, Zhang faces a maximum penalty of five years in prison and a $250,000 fine. Investigators currently are working to gather information for the devices but have initially determined that Zhang is linked to China's intelligence services and appeared to be on some type of spying mission. Zhang entered Mar-a-Lago claiming she was going swimming and also that she was at the resort to attend a United Nations friendship event, according to the indictment handed down Friday afternoon. Security personnel mistakenly allowed her on the highly secure property by falsely believing she was a relative of a Mar-a-Lago Club member also named Zhang but in reality not related to Zhang Yujing. According to court papers, Zhang entered Mar-a-Lago after the area had been declared a protected zone on March 28 in preparation for a visit by President Trump, who frequently travels to the resort and in the past held a summit meeting with China's President Xi Jinping at the location. During the March 30 incident, Zhang showed up at the resort and presented two Chinese passports as identification and said initially she planned to go swimming. When questioned later by Secret Service agents, Zhang stated she was attending a United Nations event, and it was ultimately determined she was not allowed at the club. At one point, Zhang verbally abused the Secret Service agents questioning her and was arrested, according to an FBI affidavit. "During the second interview of Zhang, she claimed her Chinese friend ‘Charles' told her to travel from Shanghai, China to Palm Beach, Florida to attend this event and attempt to speak with a member of the president's family about Chinese and American foreign economic relations," an affidavit in the case states. Asked to further identify her contact, Zhang stated that she had only spoken to him via the Chinese messaging app WeChat. Zhang was carrying with her at Mar-a-Lago four cell phones, a laptop computer, and external hard drive and a thumb drive. The FBI said the thumb drive contained malicious software. Later analysis has not confirmed that malware was contained on the flash drive carried by Zhang. Law enforcement sources said there are indications Zhang is linked to one of China's intelligence services. Those services engaged in that type of spying include the Ministry of State Security, Ministry of Public Security, and Second Department of the People's Liberation Army General Staff, a military spy agency known as 2PLA. The case of Zhang appears similar to another Chinese spy case involving China's use of nonprofessional intelligence collectors on risky missions. In February, a Chinese student linked to Beijing's Public Security Ministry received a one-year prison term for spying on sensitive communications near Naval Air Station Key West, a sensitive defense and intelligence base. Like Zhang at Mar-a-Lago, Zhao Qianli was a Chinese national who lied to the FBI in saying he was a music student visiting Florida as a tourist during his arrest for illegally taking pictures and video at the Naval base. Zhao was later found to have been a member of the Ministry of Public Security, an internal Chinese police and intelligence service that does not normally conduct foreign intelligence missions. Investigators traced Zhao's movement and found that he had been in contact with Chinese intelligence officers in the United States. The two cases are similar in that the perpetrators did not show professional intelligence tradecraft in both the attempted spying operation at Mar-a-Lago and the one in Key West. Theories as to Zhang’s target at Mar-a-Lago range from attempts to spy on people close to the president who are members of the club to a mission to test security procedures at the club that could be useful for more professional human intelligence operations. The intrusion was a wakeup call for the Secret Service and FBI that are charged with countering Chinese intelligence activities, especially those targeting the president and his staff. Since Trump was elected in 2016, a large number of Chinese nationals have joined the club. Exiled Chinese billionaire Guo Wengui, who is a member of Mar-a-Lago and who has been targeted by the Chinese government, said he has warned security at the club that China will use women agents to try and gain unauthorized access. Guo said in an interview that he learned last year nearly a thousand Chinese nationals sought to join Mar-a-Lago. "This is typical of China's spy system," Guo said. "The MSS will go to great lengths to conduct such infiltration and intelligence operations." During a court proceeding, Zhang's public defender, Robert Adler, presented a receipt for a wire transfer for $20,000 made to a Chinese company that processes payments for promoters who sell tickets to charity events held at Mar-a-Lago. The wire-transfer receipt was dated Feb. 19 and showed Zhang had made the payment to a Beijing-based company linked to Li "Cindy" Yang, former owner of an Asian day-spa who had a consulting company that advertised access to Trump and his family. The wire transfer was made to Beijing Peace and Friendship Management Consulting Co., Ltd. The indictment appears to be the first step in an ongoing investigation, and more serious intelligence-related charges could be forthcoming. Zhang’s lawyer could not be reached for comment and did not return an email seeking comment. Robert Adler declined to comment. This entry was posted in National Security and tagged China, Donald Trump. Bookmark the permalink.